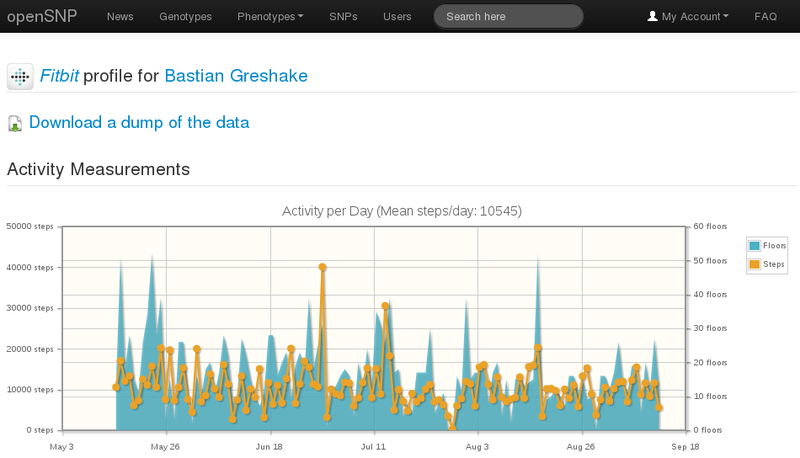 Basti has been hard at work linking the Fitbit-API to openSNP – if you’re a customer of Fitbit, you can now connect your Fitbit-data with your openSNP-profile to give researchers around the world an even better picture of how your genes interact with your health. The new Fitbit-phenotype-overview – still kind of empty! There are several SNPs associated with an increased risk of developing obesity, SNPedia has a very good overview here. For example, some variations are involved in how early your body starts to store fat, or how strong your appetite is. Carrying these variants, however, does not mean that there’s nothing you can do about your weight – there are some studies showing that regular exercise helps alleviate these effects (see here, for example). This is where the Fitbit-data comes in – it gives researchers a detailed overview of your movement-patterns, the status of your body-weight and your sleep patterns. Using this data scientists can then perform association-studies by comparing weight and activity-data to known and unknown SNPs linked to obesity. You can also link your sleep-data (if you are tracking it) – this enables research into the genetics behind some sleep disorders. Another reason why it’s great to collect data through a technical device instead through surveys it that all data which comes through the Fitbit-API is normalized into standardized units. This makes it much easier to compare the data, as you don’t have to convert between units (metric & imperial system) or have to work around spelling mistakes etc., while it also allows to circumvent the cognitive biases we all have while answering questions about ourselves. And of course it’s also is more convenient for you, because you don’t have to update your BMI and activity-pages manually, as we automatically will get your latest Fitbit-data. This means there is one profile less you have to worry about! As a bonus, the level of detail in this data is a level researchers usually can’t reach due to time and financial constraints. 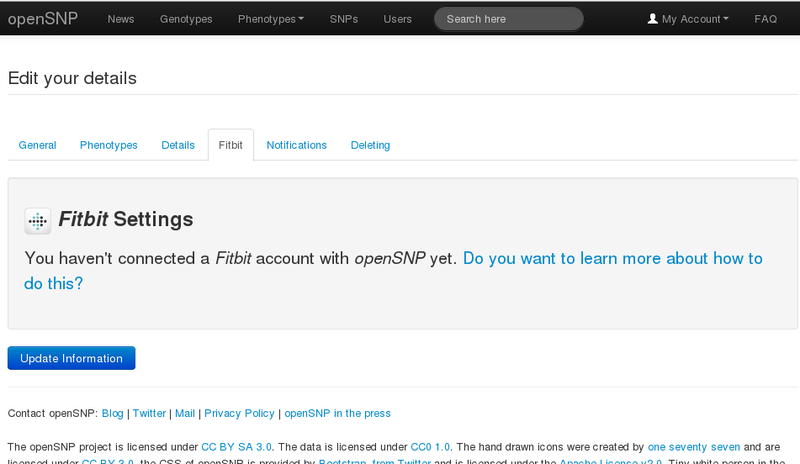 Linking a Fitbit-account to openSNP is a matter of just a few clicks – once you’re logged in, click on My Account, then on Settings and under the Fitbit-tab you’ll be able to go through the procedure. Alternatively, here’s the direct link to the page. Of course, you can specify which data is going to be shared with openSNP – we don’t automatically take all of it, because that wouldn’t be very nice of us. After you’ve approved that you want to link Fitbit and openSNP you will get redirected to a page where you can choose which categories should be shared and mirrored on openSNP. And yes, you have to submit the form which selects which categories you want to share, until you’ve done so we will not grab any data. 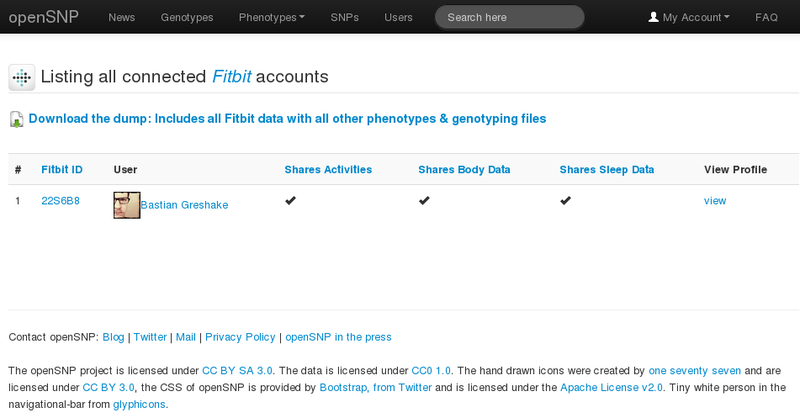 Note that: a) the data at openSNP is automatically updated with new data from Fitbit along with all the data you have put into Fitbit so far and b) you can always unlink your Fitbit account from openSNP, this also deletes your Fitbit-data on our end, in the settings. If you’re interested in this data, it’s from now on available in all data-dumps in CSV-format for easy parsing (available on the genotypes-page, or directly here). Please note that the CSV lists 0 (that is zero) for missing data-points. We’ve also slightly updated the design of openSNP to the newest Bootstrap-version. You shouldn’t have been affected by that (except in the way that things now look a bit nicer. For example take a look at the SNP-pages which now show pie charts for the allele & genotype-frequencies) , but if you find anything wrong, please tell us in the comments or at info@opensnp.org!